The new book on the life of the late Brian Pillman, Crazy Like a Fox: The Definitive Chronicle of Brian Pillman 20 Years Later, is one of the most fascinating and compelling wrestling biographies ever written and is a must-read for anyone interested in this fascinating story that held so much promise but ended up tragically going out of control. Dan Lovranski had a chance to sit down and discuss the book with its author, Liam O’Rourke. What are some of your earliest memories of pro wrestling and what attracted you to it? WWF and WCW really started to get big here in the UK in the early 90s it seemed – the WWF was featured pretty prominently on Sky Sports, and WCW somehow landed a great timeslot on ITV (which is like a network station) on Saturday afternoon. My older brother was into it before I was, so I would be kind of looking over his shoulder, and as with every fan, it’s just mesmerizing when you start watching. I couldn’t even tell you specifically what it was that I found appealing about it, there’s no one thing that makes wrestling great to me, it’s the whole package. The drama, the action, the characters, the promos, the energy, everything. Summerslam 1992 got a lot of press since it was in Wembley Stadium, and that’s when I remember really paying a lot more attention to it and watching as much as I could. What made Pillman stand out for you? Was it the Loose Cannon character or even before that? Definitely before. When I’d be watching Worldwide in 1992, he was one of the guys that really stood out. Funnily enough, I hated him as a kid since he’d just turned heel at the time and his brand of condescending sarcasm was pretty unique on an otherwise sterile show. Having said that, there was just an intangible quality there that made him memorable to me right away. There were certain guys in WCW at the time that fit into a category of people you could sort of tell were capable of far more than the environment would allow – Austin and Foley being two others I remember thinking it about. Then, after forming a negative opinion of him at first, I’d go to the video store and rent old tapes, and he was an amazing babyface, which kind of opened my eyes to how talented he was pretty early. How tough was it to write a book when the principal character is no longer with us? It’s tough in the sense that the research into the background becomes a lot harder, because there isn’t the first-hand account that helps move things in a certain direction and given how loaded with stories the book is from family, friends, and eyewitnesses, I can only imagine how it could have looked if he were alive. Given his insight, intelligence and things he’d experienced, the fact we’ll never have a Brian Pillman autobiography is a real shame, because it may have ended up as the all-time best given the course of his life. There was an advantage, in a sense, in that given how sadly things ended for Brian, whenever I was able to make contact with somebody from his past and told them what I was hoping to do, people were very keen to share their stories and memories with me for the book, and were incredibly generous with their time to make sure the details and context were on the money. A few people really went out of their way to give me the best, most comprehensive picture of his outlook and mindset possible. The book could have ended up simply average if it weren’t for the people that knew and loved him really wanting to make sure it was done correctly every bit as much as I did. Did you attempt to talk to McMahon or did he decline? Would love to hear him justify that RAW thing the day after Brian’s death. I sent something WWE’s way, not expecting to hear back, and didn’t. Like you, I don’t see there being any way to justify the train wreck the night after his death (although Bruce Prichard tried on his podcast, which held no water). Having said that, it would have been interesting to get an honest perspective of Brian’s state of mind from Vince, but I don’t know how accurate or worthwhile it would have been in truth. Was an attempt made to reach out to ex-wife Melanie? I’m guessing she didn’t want to be involved. I did and didn’t hear back. But I’d be less than honest if I said that I did everything I could the way I did with certain other people. Melanie doesn’t come off well in the book, not by design, just from what everybody told me, and I know that she’s going through a lot of issues. It’s one of those “What are you going to get?” situations, and while I made attempts out of fairness just to get her side of the story, so many people I trusted had warned me against it that when it didn’t look like it would happen, I accepted it. How essential were Kim Wood and Dave Meltzer, Brian’s sort of co-conspirators, to the crafting of not only your book but the Loose Cannon character? Dave Meltzer is a huge influence on me in general and has been since I started studying journalism. In terms of direct impact on the book, Kim had told me early on that if I wanted it to be any good, I absolutely, positively had to talk to Dave, no excuses, it had to be done. So I hassled him for about a year, every week, to try and find when he’d have the time to talk. His schedule is insane, he works so hard and for so long that it was tough, but we finally managed it. I think it was so important not just for the stories he shared or credibility he brought, but because Dave spoke to everybody. He’s in this remarkable position as the one true neutral party, even though he was good friends with Brian, that is able to contextualize a lot of the things that happened not just from Brian’s outlook but within the framework of everybody’s position at the time. I think that really shines as one of the book’s strengths, is the interpretation of the events and impact they had, and Dave was key to that. In terms of the Loose Cannon, Kim was more directly important because a lot of the plan was his. Not the whole thing, but a good portion of it was. It was Kim’s idea to work on the inside with Bischoff to kayfabe the guys, and it was ultimately Kim’s suggestion to Brian to get the termination papers from Bischoff to allow him to negotiate with the WWF while he was hot. Kim was a constant sounding board and reference point, and while Brian had a lot of people he’d bounce things off, it really was only Kim and Brian that knew the end game from start to finish. And even then, as Kim said, so much of that was luck, fate, and just plain making it up as you go along. I think Dave was especially important to Brian (after he was clued in) when it came to gauging the response from within the business as his plan gathered steam. Meltzer had told me that they would talk constantly during the period of the negotiations about what was being offered and how to play it with both sides. What Brian did, and it was brilliant, was letting a handful of important people into a certain degree, because people will let you get away with a lot so long as they think they’re on the inside. But the only people that really knew the end game was Brian, Kim, and Dave, and when you consider how far he went with the character, that’s a very select group of very intelligent, well-informed people to collaborate with. My personal favorite section of the book is the period of the Loose Cannon and being able to talk for hours with Kim and Dave about it was just a thrill. What do you think personally of his approach as the Loose Cannon? Did he try too hard to live the gimmick? The approach was a work of genius. When you really sit back and think about the position he was in before it started, compared to the position he found himself in right before he wrecked the Humvee, it’s amazing. After hovering at the same level for four years, he’d effectively doubled his value in five months, when you look at the contract offers. He did it without drawing any extra money, without drawing any higher ratings, or moving any metric outside of what he was already doing. It was an illusion. He figured out that the people in charge, who were desperate to be winners in an industry that had a few losing years in a row, were marks to be played. Manipulate the surroundings to create a perception of value that they’ll both fall for. Not only that but as the book details, the research he did on how to pull it off, the way he worked to change his character and the things he did on the spur of the moment, just by reading the landscape, it was completely awe-inspiring. As for trying too hard to live the gimmick, it’s hard to say no given how things ended up. It’s a double-edged sword – if he didn’t go all the way, it may not have been the exceptional piece of work that it was, but you’d think there was a line internally he knew he was crossing when he would be doing things that were bad for his wellbeing. At the same time, he lived a wild lifestyle anyway, even before the Loose Cannon. He’d tried to quell it somewhat a couple of years before, but in light of some personal tragedies and just his general nature, he was certainly more careless at that point than he’d been before. In many ways the thrill of the work consumed him, but there was a lot going on, and he was losing his grip on the situation. By the end, in that last few months, he was long past the tipping point. It’s a very sad period, and he was doing a lot of dangerous things that somebody with his intelligence knew were dangerous, and he did them anyway. He was a troubled soul in the last couple of years, and it certainly overwhelmed him at the end. What do you think he would be doing now if he had survived? If he didn’t have the wreck he’d have made it big, no doubt in my mind, and would probably have been around in some form forever. He would tell close friends that his plan was to wrestle to 40, but Brian wasn’t the type of guy content to just sit on his back porch reveling in the fruits of his labour, he needed to chase something. He’d really grown to love a lot of aspects of wrestling, so I think it would have ended up as his life long after he’d hung up the boots. If he’d been able to keep himself together, a big if, but a clear-headed Brian could have been where Michael Hayes is or higher in my opinion, right in Vince’s inner circle. He was that bright and he had that rare drive and work ethic that you need to be around Vince at that level. 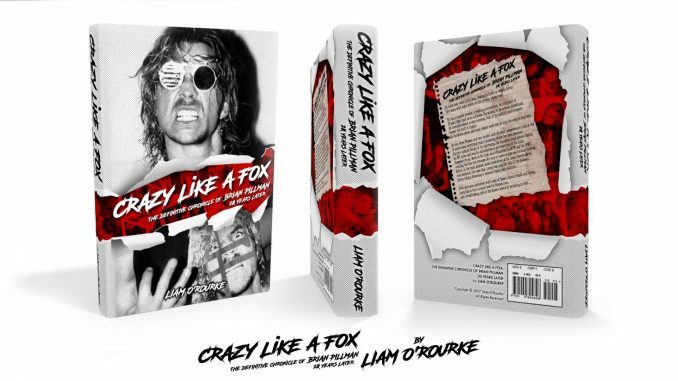 Crazy Like a Fox: The Definitive Chronicle of Brian Pillman 20 Years Later is available on Amazon.